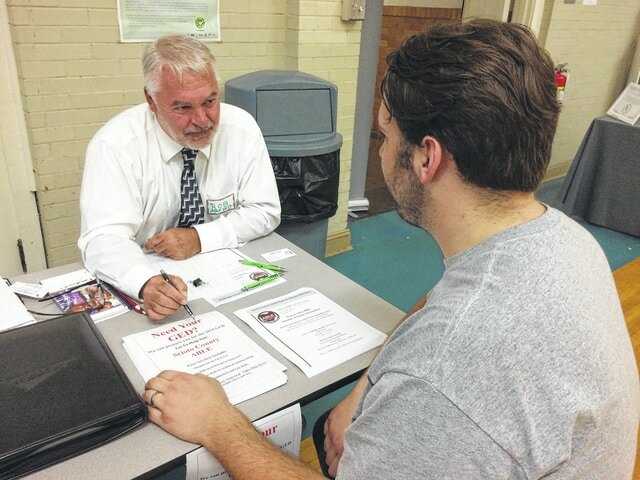 Submitted Photo ABLE Director Rob Seaman (left) discusses the many programs and services available with visitors at The Counseling Center’s Job Fair. The Adult Literacy & Basic Learning Office of the South Central Ohio Educational Service Center (SCOESC) participated in a Job Fair at The Counseling Center on Nov. 5, 2015. “We are here to inform their clients what services we can offer to them, which is not only GED prep but also under-educated adults; folks that maybe have their high school diploma but still need some remediation,” said ABLE Director Rob Seaman. The ABLE Department offers classes at flexible locations, and on different days and times to meet diverse needs. In addition to helping people complete their GED, the ABLE Department also provides services for family literacy, workplace literacy, corrections education, distance education, and transition services. Mindy Keaton, outpatient treatment director at The Counseling Center in Portsmouth, said the first start for many of their clients on their path to recovery is obtaining their GED. For more information about the ABLE program, contact them at 740-354-0211 or visit one of their many locations – at the ESC in New Boston, the Scioto County Career Technical Center in Lucasville, or at Shawnee State University in Portsmouth. Classes are free and are available in the day or night. For more information about the ESC, visit online at www.scoesc.org<http://www.scoesc.org/>, or follow on Facebook and Twitter.